Rare Bird Books, 9781940207650, 240pp. In 2011, Mike Spitz began photographing dozens of record stores in and around the greater Los Angeles area, rich with old and new record shops, to capture the lively experience of going to the independent record store. Beautifully wrought on color film, his photographs illustrate how each store has a unique and vibrant culture, and the stimulating experience of being in a record store and discovering that rare vinyl record, cassette or 8-track tape, memorabilia, vintage concert poster, turntable, nostalgia, or other music-related gems. The inclusion of in-depth interviews with store owners demonstrates how record stores cultivate a communal gathering place for human interaction, exploration and discovery. 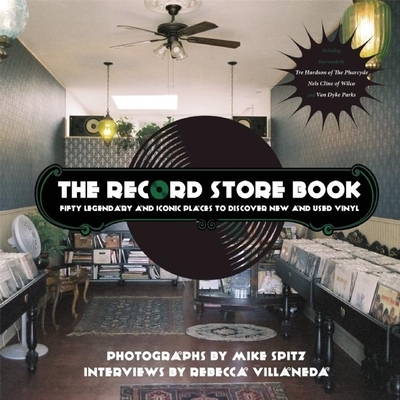 In chronological order from the oldest existing stores, such as Canterbury Records that opened in 1956 in Pasadena or Music Man Murray Records that opened in 1962, to the most recently opened stores, The Record Store Book respectfully marks the changing of the guard from the older to the newer generation of stores as each owner shares facts, store history, and distinctive points of view regarding how people search for, find and appreciate music. Mike Spitz got his first drum set when he was eleven years old -- a sixties red sparkle Ludwig. On his walks home from elementary school, he used to stop into the local record store, Everybody's Records, on Montgomery road in Cincinnati. It was at that time in the late seventies and early eighties when he began to collect records and CDs, many of which he still has today. He moved to Los Angeles in 2000 and found his artistic home in still photography, where he has stayed. Spitz has been able to revisit his musical roots by merging his interests of photography and music in The Record Store Book. Spitz's photographs have been seen at the F9 Gallery in Los Angeles, Artists Haven Gallery in Ft. Lauderdale, FL, Amsterdam Whitney Gallery in New York City, and the Infusion Gallery in Los Angeles. His most recent exhibitions include the Julia Dean Photo Center Gallery in Los Angeles, the 2012 International Juried Show at the North Valley Art League in Redding, California, the Los Angeles Brewery Spring Art Walk, and the ADC Contemporary Art Gallery at Bergamot Station in Santa Monica, CA. When he's not out collecting records, Spitz has an MSW in social work and a full-time career as a licensed clinical therapist working with behaviorally and emotionally challenged children. He also has taught photography to troubled teenagers, using it as a therapeutic means for self-expression and creativity. Mike became a first-time father in March of 2014. He lives in Silver Lake with his girlfriend and son Max. Rebecca Villaneda is a Los Angeles-born writer educated in southern and northern California. She now lives in Santa Barbara. She is the youngest of four children, all first-generation Americans. She received her bachelor's degree in journalism at San Jose State University, and became a writer to raise awareness of social and environmental issues, and because her mother's passion for the written word was contagious. She was a staff writer for the national online magazine, HispanicBusiness.com, where politicians and international entrepreneurs were her subject matters. These personality types, coupled with musicians, philanthropists, and scientist, have given Rebecca a strong versatile foundation in the art of interviewing. Her first book, a collection of autobiographical short stories titled Stories 4 Women, was a collaboration with three other writers released in November 2010. The Record Store Book is a dream project for her; she is passionate about music and everything and everyone it touches.